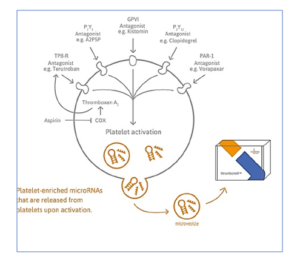 TAmiRNA has released a new technical note exploring use of it proprietary circulating platelet-derived microRNAs (thrombomiRs™) as non-invasive biomarkers for measuring the effects of P2Y12 anti-platelet therapy. The paper shows how the TAmiRNA thrombomiR™ RT qPCR kit can be used to determine the effects of anti-platelet treatment using either clopidogrel or ticagrelor on plasma and serum levels of thrombomiRs in a cohort of young and healthy individuals. The paper describes a three-step protocol: RNA extraction, cDNA synthesis and RT qPCR amplification. Platelets are a rich source of microRNAs, inheriting their microRNA content from precursor cells and possessing fully functional machinery for post-transcriptional regulation. Recent research strongly suggests that certain microRNAs are much richer in platelets than other cell types and tissues. Stimulation of platelets via different receptors and agonists encourages secretion of microRNA from platelets via extracellular vesicles (EVs) into the blood (plasma). Therefore, the activation as well as pharmacologic inhibition of platelets can result in an increase or decrease of plasma platelet-derived microRNA levels, respectively. All of this is possible based on analysis of stored (deep frozen) plasma or serum samples. TAmiRNA has designed and developed the thrombomiRs™ RT qPCR kit to facilitate standardized quantification of 10 platelet-derived microRNAs (thrombomiRs) with six quality controls in human plasma samples. In a study conducted by Prof. Dr. Manuel Mayr and Dr. Temo Barwari at King ́s College, London, 30 healthy and treatment-naive volunteers were randomized to placebo, clopidogrel (Plavix), and ticagrelor (Brillique) treatment. Platelet-poor plasma was collected at baseline and after a seven-day course of therapy. 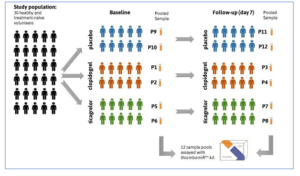 Plasma samples from five randomly selected subjects per group were pooled, resulting in four pools per group (two at baseline, two at follow-up), with 12 pools in total. The thrombomiRs™ RT qPCR kit was used to assay 10 platelet-derived microRNAs (thrombomiRs) and one control microRNA (miR-122, liver- derived) in all pools. The miR-122 served as a liver-specific control that is not present in platelets. Three spike-in controls and two hemolysis controls complemented the selection. Presentation of platelet-enrichment was based on the Kaudewitz protocol (2016). The thrombomiRs™ RT qPCR kit enabled quality control by using synthetic spike-in controls, provided with the kit. These were essential to obtain complete understanding of analytical variability in data, identify potential outliers due to failed RNA extraction and choose an appropriate normalization strategy. RNA-isolation efficiency (UniSp4), cDNA synthesis efficiency (cel-miR-39-3p) and PCR amplification (UniSp3) were also monitored to detect the presence of enzyme inhibitors and ensure equal purification efficiencies. In addition, the thrombomiRs™ test returned data on the effects of hemolysis on the analyzed samples by determining the ratio between miR-23a-3p and miR-451a. This ratio has been repeatedly shown to be indicative of red blood cell lysis in serum and plasma. 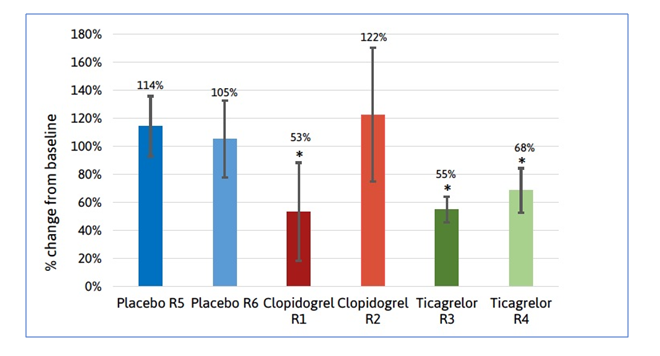 The anti-platelet therapy study showed clear overall reductions in plasma levels of thrombomiRs between baseline measurements for placebo, clopidogrel and ticagrelor and 7-day follow-up. 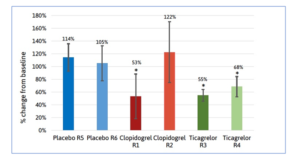 The thrombomiRs™ RT qPCR kit detected a significant and even decrease in plasma thrombomiR levels in one clopidogrel group (47% average reduction) and in both ticagrelor groups (45% and 32% reduction, respectively). As expected, no significant changes in thrombomiR levels were observed in placebo treated groups or in the group of clopidogrel treated individuals. This observation was significant because, unlike ticagrelor, clopidogrel is a pro-drug that requires activation to the active drug compound by liver enzymes. There is evidence that specific livery enzyme variants are required for efficient activation, and that activation can fail in critically ill patients. Therefore, TAmiRNA’s observation that only one group of patients treated with clopidogrel shows a significant reduction in thrombomiR levels might be related to inadequate treatment response. The study also observed that platelet-derived microRNAs were significantly reduced in plasma but not serum following a one-week course of mono anti-platelet therapy and that circulating levels of miR-122 increased after a one-week course of clopidogrel treatment, while remaining constant in ticagrelor treated individuals. Again, this is a significant finding. In liver, miR-122 is known to regulate a number of genes associated to fatty acid and cholesterol synthesis and changes in circulating levels of miR-122 are known to be associated with lipid levels and therefore informative of liver injury as well as the risk of new-onset metabolic diseases. In summary, the TAmiRNA thrombomiRs™ RT qPCR kit provides an easy-to-use RT-qPCR protocol that includes all reagents required for standardized analysis of ten platelet-derived microRNAs in human plasma or serum. 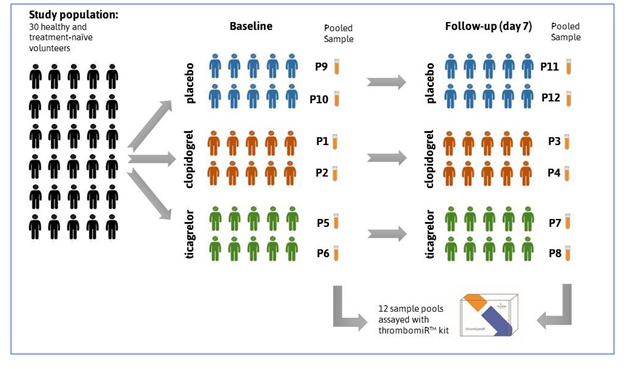 The example study demonstrates application of the kit to quantify the effect of two types of P2Y12 mediated anti-platelet therapies on thrombomiRs levels in platelet-poor plasma and serum, observing even and significant reductions in thrombomiRs levels after 7-days in the ticagrelor group and further showing that thrombomiRs response to clopidogrel treatment is more heterogeneous, and might result in an enhanced liver metabolism compared to ticagrelor treatment. Click on ThrombomiR anti-platelet testing for more information. Click on toxomiR testing for detailed information. Click on Anti-platelet study to access original technical note.